A fullerene is a molecule which mainly consists of the element carbon. It may take the shape of an empty sphere, tube or ellipsoid. 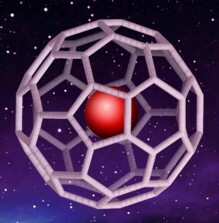 Cylindrical fullerenes are also referred to as buckytubes or carbon nanotubes. On the other hand, spherical fullerenes are named as buckyballs. It was discovered by the scientists Robert Curl, Richard Smalley and Harold Kroto. They named it as buckminsterfullerene as an honor to the scientist named Richard Buckminster Fuller. He discovered the geodesic domes that have a resemblance with the fullerenes. It was first extracted from meteorites and sedimentary layers which are believed to be 65 million years old. They are also claiming that its properties show its extraterrestrial origin. Buckyballs come in various sizes. It may range from 20 carbon atoms to 540 atoms. A solution of fullerene is seen in purple color and is the only allotrope of carbon that is dissolved in small quantities of liquids. Studies on buckyballs led to the synthesis of almost 1000 new compounds of different properties. Nanotubes were also discovered and manufactured. Even though there are many new discoveries related to buckyballs, its specific practical application is not yet established which is due to the high cost of the material. As of the moment, its use in the field of medicine is being studied specifically on its possible treatment properties against HIV. With deeper research, this compounds that may have come from the solar system could help us in the future in various ways.